I am sure you have heard this before but please remember to provide something at your reception to hold all your cards - most likely they have money in them. We wouldn't want a guest just walking by and taking one or all of them. Good options are a covered box - see above or something simple like a hinged basket. You want to make sure that hands can't reach in and grab something out. You can make this part of your decor by using a bird cage if you have an outdoor wedding or a red canvas box for an Asian wedding. 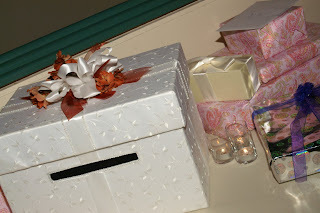 Your wedding planner can watch over the items and make sure they go in the appropriate car at the end of the night. If you are at a hotel please have someone go with the bellman to your room with the gifts. I have heard of them taking gifts to the wrong bridal suite. Just remember to secure your gifts and gift cards so no one but you gets to enjoy them.